What Mr. Cohen has is his own: a joy in language, and an eye, at once innocent and shrewd, for the paradoxes inherent in the human condition. He puts both language and people through their paces, stands them on their heads, and hugs them to his heart in what amounts to a tour de force of serio comedy, a sort of superb clowning in which pathos and absurdity intertwine as they do in a Chaplin film. “Marvin Cohen’s wacky humor,” the late Thomas Merton once said, “has something of ’Thurber, something of Steinberg, Buster Keaton, the surrealists, the French pataphysicians.” And this in itself is a fair enough assessment, to say the very least, of The Monday Rhetoric of the Love Club, a collection of twenty-one of the prolific Cohen’s parables, prose poems, fables, and dialogues. 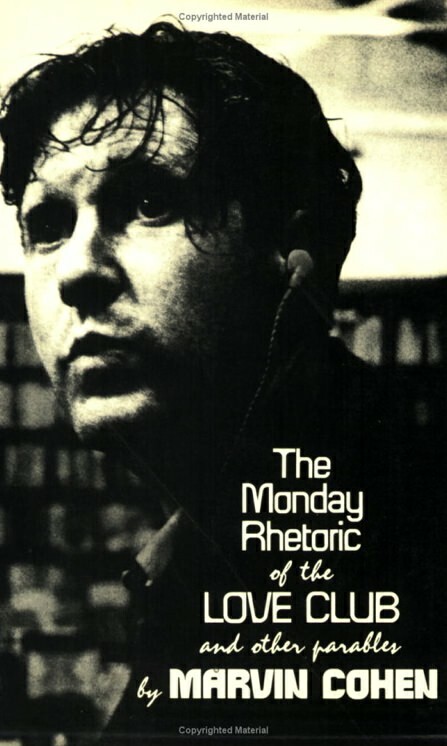 Two of the pieces, including the title story, originally appeared in the New Directions in Prose and Poetry series; most of the others were selected from the many other magazines and anthologies in England and the United States in which Cohen’s shorter works have been published.